Citation Information: J Clin Invest. 2006;116(5):1140-1149. https://doi.org/10.1172/JCI28605. Skin and bone — what comes to mind at hearing this phrase? While certainly a metaphor for disease, it also defines two very different tissues, one a flexible and contiguous outer covering, the other a morphologically diverse hard tissue distributed at over 200 sites in the body. As the accompanying series of Reviews highlights, these tissues are indeed diverse, but there are also surprising similarities. Skin is the interface between the internal organs and the environment, and as such plays a crucial role in the body’s defense mechanism. The skin and its many appendages are responsible for functions as diverse as epidermal barrier and defense, immune surveillance, UV protection, thermoregulation, sweating, lubrication, pigmentation, the sensations of pain and touch, and, importantly, the protection of various stem cell niches in the skin. Bone serves a number of purposes: it provides protection for vital organs, a lever for locomotion, a reservoir for calcium, and the site of adult hematopoiesis. The tissue is composed of osteoblasts, osteoclasts, and their individual precursors plus a complex mixture of mesenchymal, myeloid, and lymphoid cells in the marrow space. Finally, the endothelial microenvironment provides nutrition and is a conduit for the influx and emigration of cells that impact bone biology in several important ways. This Review series guides the reader through these various facets of 2 diverse, yet interdependent, tissues. Schematic illustration of several key elements of the skin. As indicated, the skin is divided into 2 main compartments, epidermal (tan) and dermal (pink), separated by a basement membrane (blue). 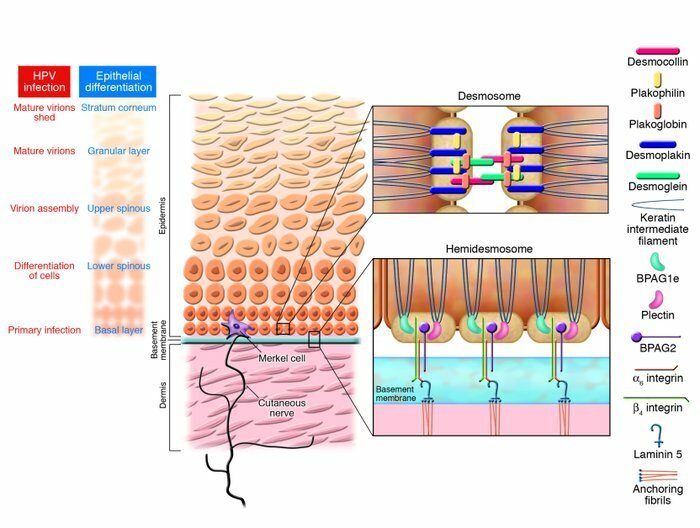 The epidermis serves as the protective barrier, due to the differentiation of proliferative epithelial cells in the basal layer to the terminally differentiated cells in the stratum corneum. The sites and development of HPV infection are indicated at far left: the primary infection occurs in the basal layer, and mature virion sheds in the stratum corneum. Merkel cells are located within the basal layer of the epidermis (purple) and are associated with sensory nerve endings (brown). Two types of cell junctions critical for the integrity of the skin are highlighted here. Desmosomes (upper right inset) form cell-cell junctions, in which cadherins (pink and green), such as desmogleins 1 and 3, are the extracellular bridges and the autoantigens in different forms of pemphigus. Hemidesmosomes (lower right inset) tether the cells to the basement membrane and are composed of a number of proteins, 2 of which — BP230 and BP180 (also known as type XVII collagen) — are autoantigens in BP. Disruption of these interactions results in loss of adhesion of the cells to one another or to the underlying basement membrane.